As an option Kinetrol actuator sizes 03 to 15 can be supplied with integral solenoid valves with NAMUR interface. Air is ported through the actuator body via an adaptor so no external tubing is necessary. 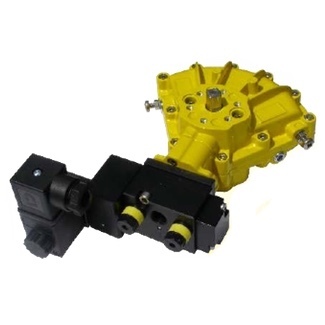 Standard optional solenoid valves can be converted to 5 or 3 port versions by changing the valve body plate supplied with the valve. Single solenoid, 3 or 5 port, interchangeable for double acting or spring return, NAMUR interface. Most brands of NAMUR interface solenoid valve can be supplied to special order.